In The Better Angels of our Nature: Why Violence Has Declined, Steven Pinker compiles massive amounts of evidence to show that we are becoming a more civilized species. The principal yardstick he uses to measure progress is the steady decline, over millenia, in per-capita rates of homicide. But he also measures declines in violence directed towards women, racial groups, children, homosexuals, and animals. Far from being hidden in dungeons, torture-executions were forms of popular entertainment, attracting throngs of jubilant spectators who watched the victim struggle and scream. Bodies broken on wheels, hanging from gibbets, or decomposing in iron cages where the victim had been left to die of starvation and exposure were a familiar part of the landscape. Today this ad’s playful, eroticized treatment of domestic violence would put it beyond the pale of the printable. It was by no means unique. A reader of that 1950s ad would be as horrified as we are today to imagine cheering a public execution in the 1350s. A lot changed in 600 years. But in the 60 years since more has changed. 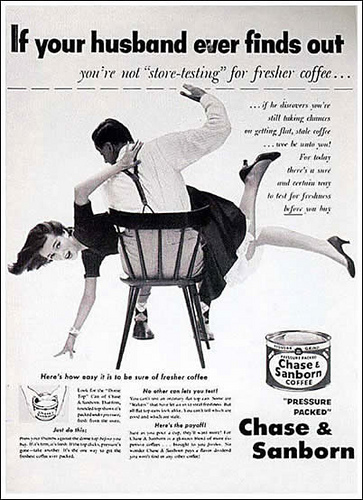 The ad that seemed OK to a 1950s reader would shock most of us here in the 2010s. Over time we’ve grown less willing and able to commit or condone violence, and our definition of what counts as violence has grown more inclusive. And yet this is deeply counter-intuitive. We tend to feel that the present is more violent and dangerous than the recent past. And our intuition tells us that the 20th century must have been more so than the distant past. That’s why Pinker has to marshal so much evidence. It’s like Darwin’s rhetorical strategy in The Origin of Species. You remind people of a lot of things that they already know in order to lead them to a conclusion they wouldn’t reach on their own. Pinker acknowledges that the civilizing trend may not continue. He doesn’t make predictions. Instead he explores, at very great length, the dynamics that have brought us to this point. I won’t try to summarize them here. If you don’t have time to read the book, though, you might want to carve out an hour to listen to his recent Long Now talk. You’ll get much more out of that than from reading reviews and summaries. Either way, you may dispute some of the theories and mechanisms that Pinker proposes. But if you buy the premise — that all forms of violence have steadily declined throughout history — I think you’ll have to agree with him on one key point. We’re doing something right, and we ought to know more about why and how. Author Jon UdellPosted on 22 Feb 2013 22 Feb 2013 Categories .